Cheese at the end of the meal seems to upend the dessert theory we described yesterday. Historically it was served after the mains but before the dessert course. This is the sequence that France adopted from Russian culture where cheese was before the pudding. However, there is a tradition of the cheese course with traditional after-dinner drinks such as port and brandy. This is the sequence that was adopted in England. Other than this, there seems little interest (on the internet) in the history of the cheese course in cuisine. There are many articles on how to prepare and serve a cheese course today. "Their styles, textures and flavors depend on the origin of the milk (including the animal's diet), whether they have been pasteurized, the butterfat content, the bacteria and mold, the processing, and aging. Herbs, spices, or wood smoke may be used as flavoring agents. The yellow to red color of many cheeses, such as Red Leicester, is produced by adding annatto." It turns out to be cheese processing. Cheeses start the same with rennet traditionally used to separate the milk into solid curds and liquid whey. The cheese sets into a very moist gel. Some soft cheeses are almost complete - they are drained, salted and packaged. Hard cheese are heated forcing more whey from the cut curd. Then there is stretching: That's what happens to mozzarella and provolone. The curd is stretched and kneaded in hot water, developing a stringy, fibrous body. Cheddaring is a process - the cut curd is repeatedly piked up, push more moisture away. The curd is mixed for a long time, taking the sharp edges off the cut curd pieces and influencing the file product's texture. Washing is key for some cheeses - edam, gouda and colby are washed in warm water, lowering its acidity and making for a milder-tasting cheese. It is at the ripening stage when cheese ages that microbes and enzymes transform texture and intensify flavour. This is where Roquefort, Silton, Gorgonzola get their blue veins. Our photo today is a laneway at the corner of Honsberger and Fairlane in Vineland. With my new camera - a Canon 6D - I know where it is exactly - 43°10'18.683" N 79°19'55.703" W. We see it before the autumn colours start. While it is near Brian's lily field, there creeks that cut off the roads. 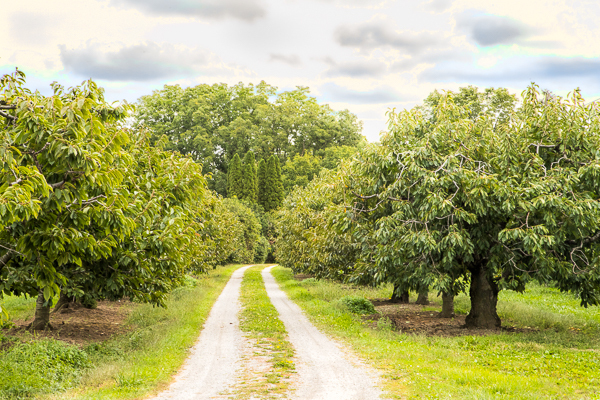 One winds one's way north and south along these narrow roads and laneways with mature orchards. One experiences the roads of Niagara from times gone by. Both Brian and I are reminded of Niagara-on-the-Lake from our youth. It had narrow roads with over-arching orchards. So we will follow this Blossom Trail this year to see what treasures it reveals.